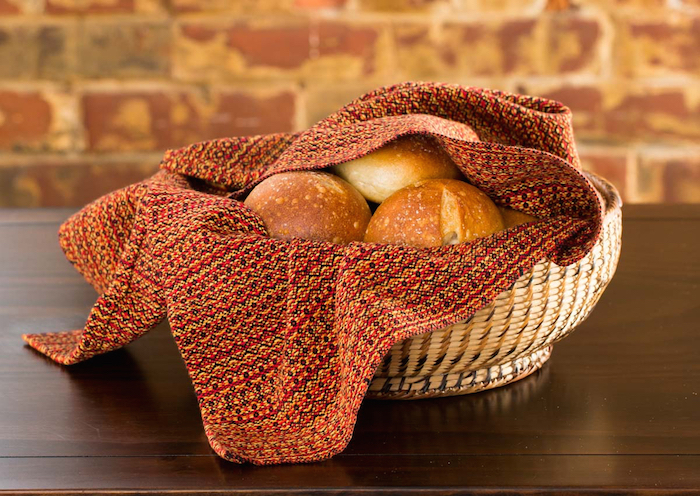 I have a project I want to weave: napkins to go with my Crisp Fall Day table runners. By “go with” I mean similar colors and a different pattern. I want them to coordinate rather than match. I make a plan and hear a quiet but as I set to work. I ignore the hesitation about my color choices and make the warp, then dress the loom. As I weave a sample that but becomes I told you so. I continue weaving, determined not to give up and doing my best to suspend judgment until the cloth is washed and dried. I take the sample from the dryer and stand by my studio window, examining it. None of the weft colors work. I am disappointed, uncertain how to move forward. So I start a project on my other loom. From time to time, I pick up the sample, hoping, longing for inspiration. And then it hits me: I am so attached to the napkin idea, so focused on what this sample isn’t, that I can’t see what it is. It isn’t napkins that will go with the table runners. It is towels! When I let go of the napkin idea, I see possibilities in the sample and eagerly weave towels, embracing the unexpected places this project now takes me. How often have I done this – focused on what something isn’t rather than seeing what it is? Not just with weaving projects. In life? P.S. On December 9 & 23rd, I’ll be at the Northampton Winter Farmers’ Market in its new location — the Northampton Senior Center, 67 Conz Street. The hours remain the same, 9am – 2pm. 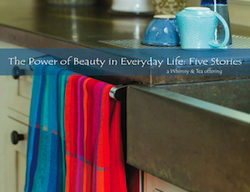 Heartfelt thanks to all who purchased Whimsy & Tea kitchen towels, napkins and/or table runners in October & November. My heavy heart felt lighter as I wrote donation checks to CERF+ (Craft Emergency Relief Fund). The donation (20% of sales) is earmarked for their disaster relief fund to help craftspeople who’ve been affected by the recent hurricanes and fires get their businesses running again. I can relate very well to your experience, Marilyn. Often when I’m creating a colored picture I don’t know how the colors I’ve chosen will look until I’ve completed a portion of the image. About half the time I’m pleased with the results. About half the time I’m unhappy with the final piece. I hang on to everything even the ones I don’t like because as you wrote, the ones that didn’t work can be seeds for a new creation. Something entirely unexpected. And everything adds to my foundation of experience so nothing is really wasted. Even if it isn’t immediately apparent where that experience will lead. One of the reasons I enjoy creative work so much!